I'm so excited to share my latest dessert table with you today. I'm doubly thrilled, because Kathleen of Twig & Thistle is kindly featuring it on her blog, as well. You might remember these behind-the-scenes sneak peeks from a couple of weeks ago. 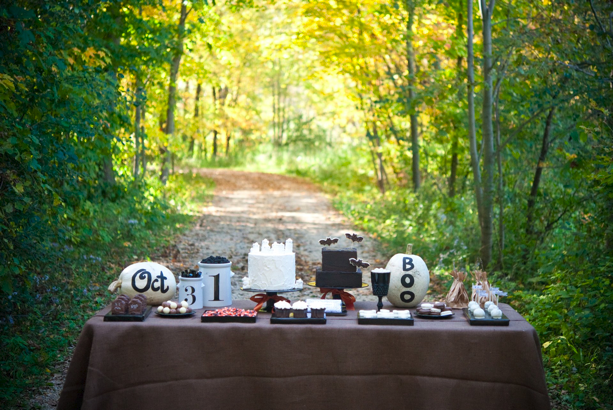 Well, photog Emily Steffen's beautiful pics capture the table and the beautiful forest much better. The Totally Target Halloween dessert table is just that. A dessert table designed using ingredients, supplies, dishware, and desserts that are all available right now at your local Super Target. Target is headquartered here in Minneapolis, so it has a pretty big presence in the area. 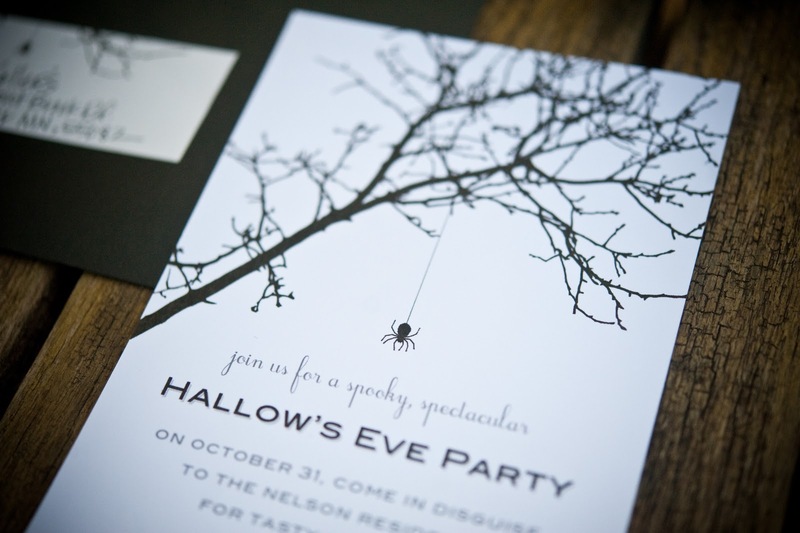 But, it's also easy to find Target stores across the U.S., making this design a really affordable option for your Halloween bash. 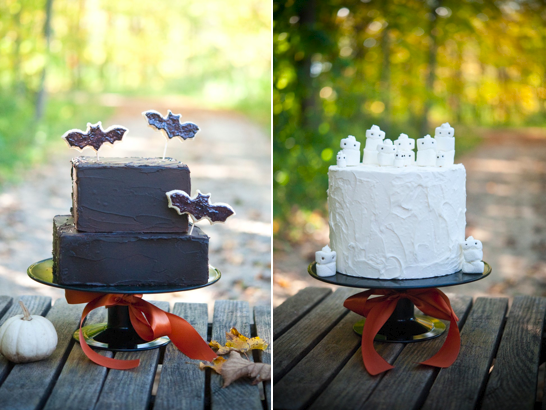 Target's black cake stands make the perfect pedestals for two great cakes. You can use a favorite family recipe or a boxed mix to make both. 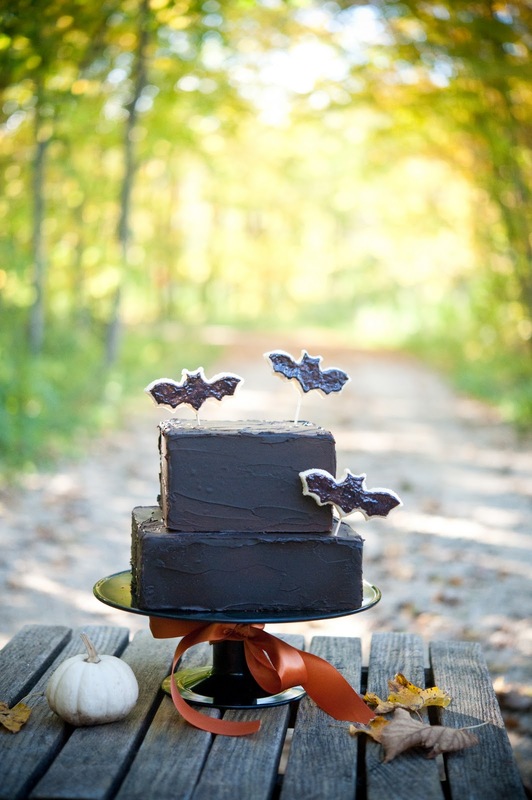 Target's bat cookie cutters and black sparkly decorating icing (in the baking aisle) add flourish to this chocolate cake. Jumbo and mini marshmallows transform into cute ghosts when you add chocolate jimmies for the eyes for this vanilla cake. I used these great jars to hold licorice and black raspberry gummies. 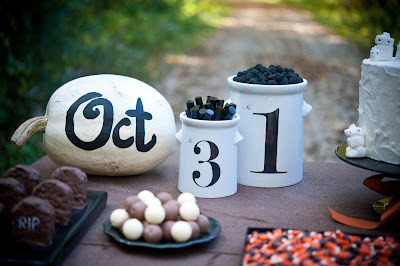 Target's white and milk chocolate truffles and candy corn go along with the chocolate-covered rice crispy treat tombstones and chocolate-covered Oreos I made. To display several of the treats, I wanted to create ceramic-looking platters. I used Target's black gift wrap to cover box lids and risers to mimic the reflective quality of traditional china. You can use books or any other flat surface to raise your treats to differing heights. favor bags: Two brown paper lunch bags make great favor sacks. Simply shred one and place another un-shreeded bag inside of it. Fill the inner bag with lots of sweet treats, insert a stick, and tie the bag closed with twine or other natural-looking string or ribbon. 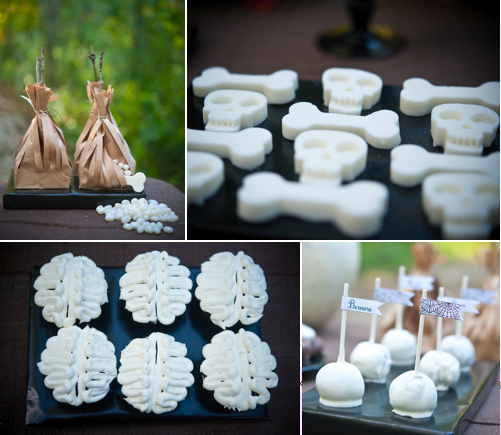 skull & bone chocolates: I couldn't find the perfect spooky chocolates, so I used Target's skull & bones ice cube trays as molds to make custom white chocolates. cupcakes: These brain cupcakes were surprisingly easy to make using buttercream and a frosting tip. You can bake them from scratch using ingredients, a box mix, or pre-made cupcakes, all of which can be found at Super Target. brownie pops: These brownie pops are incredibly simple. Bake your own brownies, buy a mix, or use Target's Market Pantry brownie bites from the bakery section. Roll a golf ball-sized portion into a ball, insert lollipop stick, and dip into melted white chocolate. I alternated the spider web flags I designed with ones that say "Boo!," "Beware," and "Howl" to add a finishing touch to each pop. 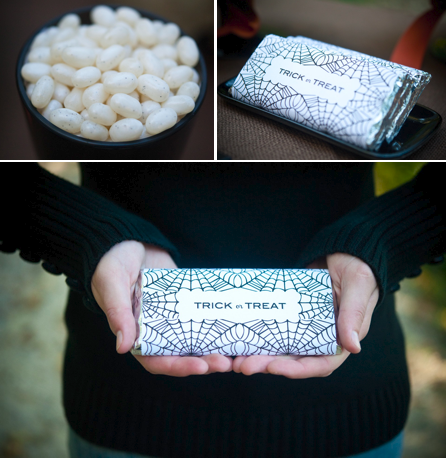 I also designed "Trick or Treat" wrappers to dress up standard chocolate bars. I painted Target's butter dish black to display the chocolate bars, while a gothic goblet housed black-speckled jelly beans. Invite designer and budding stylist Bethany Hway created these invites, which are inspired by the chocolate bar wrappers I created. I love how well they coordinate with the bars and brownie pop labels without exactly mimicking them. Thank you so much for sharing my design with your readers, Kathleen! Please head on over to Kathleen's blog, Twig & Thistle (one of my daily must-reads), to download the chocolate bar wrapper and brownie pop flags I designed. You can also download and print the invitation that Bethany Hway designed. 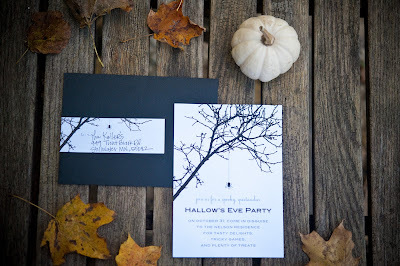 Don't forget to stop by photog Emily Steffen's blog for even more photos from this shoot. If you're visiting the Sweet Tooth blog from Twig & Thistle, thanks for stopping by. You can check out my other designs on my website or follow me on Twitter and Facebook. Absolutely fabulous! So many great ideas, love the lunch bag idea! Shauna, You were born for this! Love it all! Using the ice cube trays to make those cool chocolates was so clever! Everything is so beautiful! It's amazing how you can go to Target and get several different design aesthetics. A few days ago, I just posted some of my recent Target finds-none of which included what you just featured. (Though now I'm wanting to go back and find everything you just posted!) Great job! Very nicely done, but I really think you should have mentioned in the post that most of your ideas are from marthastewart.com. It's not correct if you don't give her the credit she deserves for coming up with all those ideas. Hi Anonymous, unfortunately you declined to identify yourself and rather than moderate or delete your comment, I'd like to respond. If you re-read my post, I never claimed that I invented any of these desserts. I simply asserted that an easy, simple Halloween dessert table can be accomplished without spending a lot of time or money. I specifically chose certain desserts, because I felt they would be easy for anyone to replicate, even a novice baker. In all honesty, I have seen these treats created by Martha and several other bakers. These are not patented or trademarked by Martha, and I didn't feel it was necessary to single out and "give credit" to any one baker in particular. In creating this table, I drew on several sources of inspiration and brought my own vision to the project. My goal wasn't to mislead anyone into thinking that I invented a new form of cupcake, but rather to further inspire others and share a fun project. Anonymous, I unintentionally forgot to include this link in my response to your inquiry. Thank you again for your comment and for reading The Sweet Tooth blog. You did a great job on this table as usual! I totally love the cupcake brains! I never thought of using icecube trays as chocolate molds! Love it! Thanks for sharing. Love the table. The 3 and 1 jars are great. I can't believe you found some of this stuff at Target. I just found your blog from Eat Drink Pretty and I am your newest follower! So inspiring...glad I found you!! Absolutely adorable! Found you from Maddycakes Muse. I'm heading to Target to get those containers! This table is so cute, it makes me want to throw a party! That might not be to realistic at this point, but I posted your link on my Favorite Friday Feeds. Thank you for sharing the downloads and the great set up. You have an eye for design. I love your blog and featured this and linked back to you on my blog today. If that is a problem, just let me know. Super cute! I love, love, love Target, so I love how you created a tablescape around items you can buy at the store! I'd love to feature this on my blog, in addition to my Facebook page. Please feel free to check it out! Shauna, thanks so much for leaving a reply to my question about your table on my blog! I went to Target today and picked up a black cake stand. Thanks again! This table is so beautiful. Hi Shauna - I've been looking around for a good Halloween printable to share with my readers, and I think your candy bar wrapper is it! I love the design - quirky and sophisticated at the same time. Thanks so much! the link to the envelope wrap via bspoke is no longer active on her site. Anyway you would consider linking that file here so that it could still be accessed?